Type/number of model: The recall affects scooters with VINs from VGAJ2AEAA80070633 to VGAJ2AEAA80070701. The product poses a risk of injuries because, due to the lack of tightening of the rear brake calliper screws, the rear brake calliper might come loose leading to an accident. Description: A red mini all-terrain vehicle. - the efficiency of the brakes is not sufficient. Type/number of model: Model name: Outlander and Renegade, model year: 2010. Model number: 2LAC, SLAD, 2MAC, 2PAC, 2PAE, 2PAF, 2SAD, 2SAE, 2UAC, 2XAC, 2XAC, 2XAD, 5FAF, 5JAB AND 5NAA. Description: Recall concerns models built during the summer and autumn of 2009. The product poses a risk of injuries because an electrical short circuit to ground of the DPS (Dynamic Power Steering) may occur. This can cause the vehicle to suddenly steer left on its own and in some situations the operator could lose control of the vehicle. Type/number of model: EAN 8427496704908. 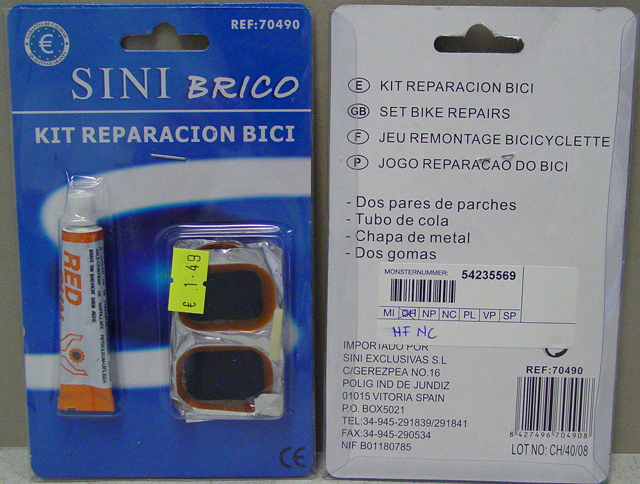 Description: Bike repair set containing rubber solution and several plasters. Rubber solution is packed in an orange/white tube. Brand name: Red Sun Contains 29% benzene. The product poses a chemical risk because it contains benzene at a concentration of higher than 1% by weight. Type/number of model: Part numbers: CCE 696732, CCE 696702, CCE 696733, CCE 696703, CCE 696735, CCE 696705, CCE 696736, CCE 696706. 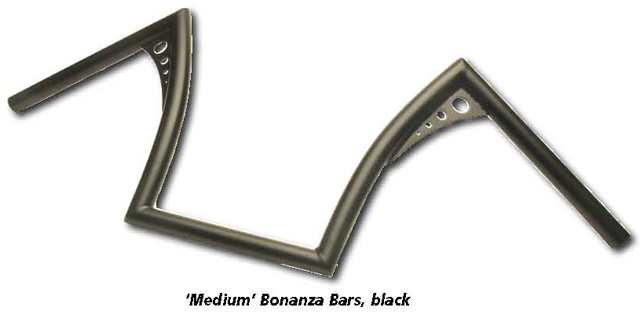 Description: Aftermarket handlebars for motorcycles. "High" and "Medium". Both models in black or chrome-plated. The product poses a risk of injuries because the welding seams may develop cracks and, in extreme cases, break altogether. Voluntary recall from consumers by the importer. The clips attaching the air filter frame may become disengaged during normal use, in which case the air filter frame may lift up allowing foreign material to by-pass the air filter. This foreign material could cause blockage of the throttle valve which could potentially lead to a road accident. 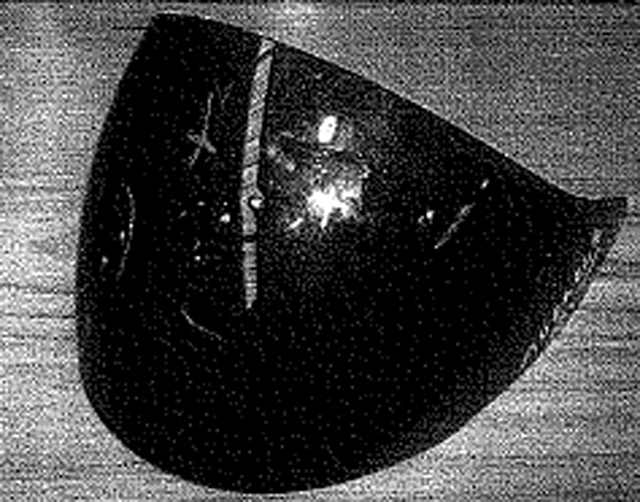 Description: Tinted visor for motorcycle helmet, colours "fume" and "iridium". The visor poses a risk of injuries because it is too dark for driving a vehicle and could lead to a road accident. Description: "Enduro" motorcycle tyre. DOT identification number: EB OY B279 0910; EB OY B279 1010. Manufactured in weeks 09 and 10 of 2010. 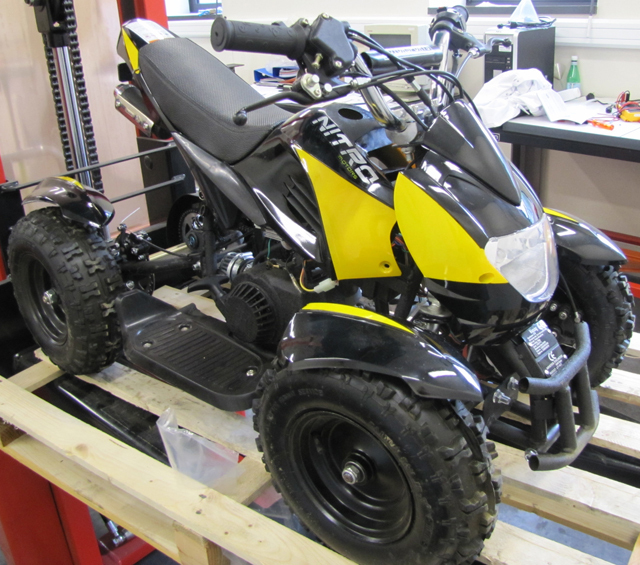 The product poses a risk of injuries because the tyres could suffer tread block tearing, which might cause unexpected vibration of the motorcycle and lead to a road accident. Voluntary withdrawal from the market and recall from consumers by the manufacturer. Description: Tinted visor to be used with the NT 200 motorcycle helmet. 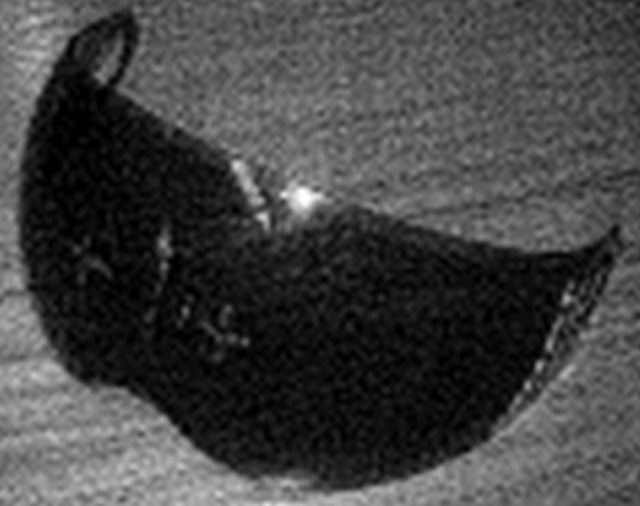 - it is too dark (the visor's light transmission being far less than the minimum of 50%). 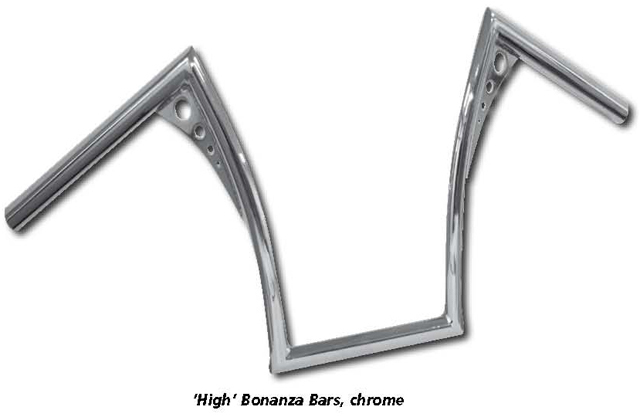 - the throttle cable can slightly stick to the frame brackets when turning the handlebar. Voluntary recall from consumers and corrective actions taken by the importer. Description: All Terrain Vehicle (ATV). The notification concerns vehicles manufactured between 2008 and 2010. The product poses a risk of injuries because the bolts securing the rear swing arm axle fastening can become loose, impairing driving stability. Type/number of model: Type QM50QT2EC Type approval No e4*2002/24*1358*00. Models manufactured in 2009 until June 2010. Chassis numbers starting with: LAEA BZ4009B99 (followed by 4 characters). 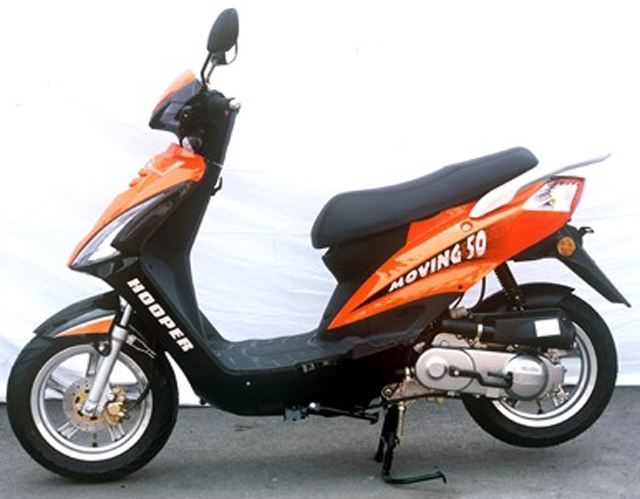 Description: Four-stroke petrol-engine scooter with 12-inch alloy wheels. 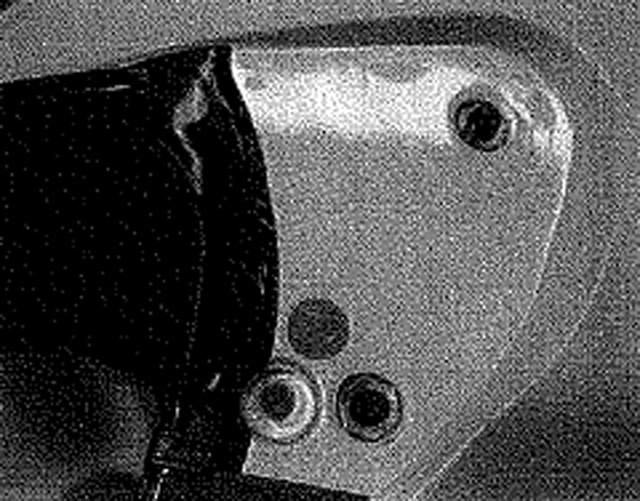 The product poses a risk of injuries because there is a possibility that the chassis can break at the level of the horizontal and longitudinal spars at the centre of the scooter, due to a structural weakness, with a consequent risk of an accident. Ten cases of breakage have been reported, including one serious case involving a fatality. 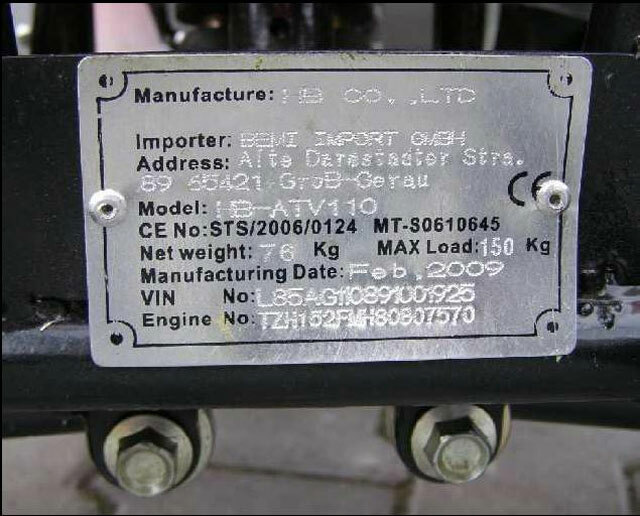 Description: The vehicles concerned were manufactured in 2009. The product poses a risk of injuries as the speedometer readings are inaccurate (up to 30% lower than the actual speed). This means that the vehicles can be driven at speeds above the permissible limit, thus increasing the risk of an accident. Type/number of model: This recall applies to certain 2010 F4 model motorcycles, built from 27.10.2009 through 07.09.2010. The product poses a risk of injuries because the upper fixture points of the rear sub-frame are not sufficiently robust, which may cause the sub-frame to break during normal use. If this occurs, the stability of the rider and the passenger would be comprised and there could be a risk of a crash. 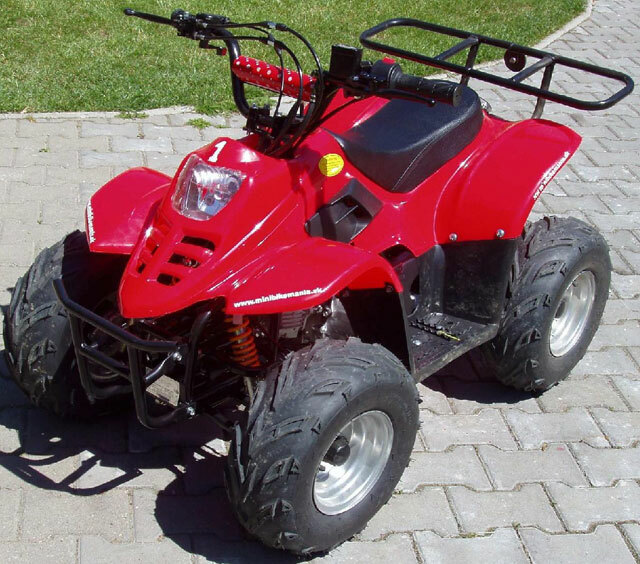 Product: Mini all terrain vehicle "Cobra II"
The product poses a risk of injuries because, many mechanical parts are not covered and the brakes can malfunction after a short period of use. As a consequence, the user may become entangled with or trapped by the machine or lose control of it, resulting in the user crashing or falling. Voluntary withdrawal from the market and recall from consumers. Products seized by the authorities. Stranica je generirana za 0.058 sekundi uz 22 upita.